The battle began with a surprise attack. It was just at the moment when Alyssa, who was in the centre of the long file created by 500 soldiers, finished the maintenance of her wakizashi in the canopied carriage. The instant she heard the voice, Alyssa stood up soundlessly and turned her look towards the rear. Being inexperienced with battle, Miyukare steps into the carriage while lowering her body in this suddenly strained atmosphere. At the same time, Alyssa jumped off the carriage. Being called out by a soldier on the platform wagon which was travelling parallel to the carriage, she nimbly jumps onto the rear side of the wagon. The platform wagon of Fokalore’s feudal army, which had experienced one improvement after the other, adopts things like cushion materials to suppress the sounds of the many large wheels rising its appearance and performance remarkably. Becoming as big to let easily 5 people board one wagon, there’s no problem even with Alyssa herself joining. The platform wagon advances as it makes an unique sound of *shuru shuru* due to the axles and cushioning, made out of monster hides, rubbing against each other. Responding swiftly to the previous voice, the soldiers went ahead by separating from the ranks of the non-combatants and prepared their weapons while facing towards the rear. While giving orders in a loud voice, they arrive at the end of the file. One of the soldiers steering the platform wagon screamed. Alyssa also saw that bizarre figure. Both its arms and legs are oddly longer than those of a normal human. All of its nails are sharp and thick. It easily possesses a height of three meters. Its body, which had barely any clothes remaining, was hairy and had an amount of ugly, swelled-up and enlarged muscles. Only its head had a face strongly tending towards that of a human. Alyssa had memories about that face. It was no one else but the knight Balzephon which Alyssa had provoked in the castle and lured to the dance hall where Hifumi was waiting. She still recalled his expression of trembling in rage. Alyssa had a bitter expression due to their misfortune of not encountering it while waiting but coming across it while withdrawing. Once she surveyed the site, she saw several soldiers being injured and shedding blood. Creating a wall by toppling over a few wagons, they shot spears at Balzephon. Alyssa jumps out using a wagon as foothold while shouting. The soldier, who operated a spear thrower in the shadow a wagon, tried to stop her, but she quickly slipped through his hands. Balzephon shifted his focus and opened his hollow eyes widely due to Alyssa’s voice. It totally doesn’t look like there’s consciousness dwelling in them. It seems like he doesn’t even recognise Alyssa. Towards an opponent that has merely half the size of himself, Balzephon simply raises his arms overhead to attack. As he swings down his long arms she barely wards off the long nails aiming at her face with her wakizashi. She used the impact on the level of destroying her balance violently towards the momentum of moving forward with a somersault. And yet she didn’t come out of it unhurt. Her cheek was cut deeply and blood was pouring out. A heartbreaking cry is raised by the soldier who saw that, but she has no leeway to react to that. Closing in underfoot of Balzephon while rolling forward, she swung her wakizashi and cut open a calf. Two, three spears pierce into his back as he squats down while raising a scream. The moment Alyssa, who passed through underfoot, tried to pursue him, she saw something unbelievable. Although she should have definitely cut up the muscles and caused an injury to the tendon of his ankle, he has already stopped bleeding and the wound is on the verge of being completely closed. Alyssa movements stop albeit only for an instant. Aiming for that moment, Balzephon drew out a spear, which caused pain to him, and casually threw it at Alyssa. It was good luck for her that the spear had no blade and was only sharpened at its tip to be used by the spear throwers. Having the collarbone of the hit shoulder broken, even her right arm, which she tried to protect with the wakizashi, got dragged into it and the forearm was fractured by the strike. Although she somehow managed to switch the wakizashi into her left hand, Alyssa, who ended up collapsing due to the impact, has received damage at the level of making it difficult for her to stand up. Three soldiers risk their lives by leaping in front of Balzephon and at the same time the rear unit makes sure to pursuit by firing the spears simultaneously. There are also some among them who throw the spears with their own hands. Covering Alyssa so that the spears won’t hit her, the three soldiers thought of only protecting Alyssa even while they were scared to death by occasional spears hitting their armours within this rain of spears that was falling down steadily. Even Balzephon, who knocked down spears while displaying his own ability, was naturally unable to handle such an amount and took flight away from the highway with several spears pierced into his body. None of the soldiers try to chase him and they all rush over to Alyssa at once. Sweating profoundly, the groaning Alyssa opens her eyes and surveys the vicinity. Countless soldiers are peering worriedly at her face. Even the soldiers, who risked their bodies to protect her, two of them get down on their knees getting ready to place her on a stretcher by supporting Alyssa’s neck without even wiping their faces which were smeared with dirt. The remaining soldier is laying at Alyssa’s feet while facing upwards without moving with a twitch. The soldiers, who noticed Alyssa staring dumbfoundedly at the unmoving man, strongly closed their eyes. The soldiers report the circumstances with squeezed-out voices. He has become the first casualty in combat after establishing the Fokalore feudal army trained by Hifumi. There were also accidents during training and deaths from diseases and afflictions unrelated to the military. It wasn’t the first time they bereaved a soldier, but the matter of him abandoning his life in order to protect her, even more so in front of her, in combat, stirred up Alyssa’s heart to the extent of making her forget the pain of her own injuries. At the time she fell into a frenzy, Miyukare, who made her way through the soldiers, slid in front of Alyssa. Without minding getting dirty, she kneels down in front of the lying Alyssa and applies a clean cloth on Alyssa’s cut cheek. Showing surprise only for an instant due to the obviously fractured arm, Miyukare, who immediately assessed the situation of the surroundings, gently hugged Alyssa while being cautious of not touching her arm as much as possible. The soldiers placed Alyssa, who lost consciousness just like that, on a stretcher and carried her to the carriage upon Miyukare’s orders. As they agreed upon the case something happened to Alyssa, the command is transferred to Miyukare. While pointing her look at Alyssa, who’s being carried, Miyukare thought about the question posed by a soldier leading a platoon with closed eyes. The expression of Miyukare, who saw the soldier nod while saying “I see”, was completely like that of a fierce god. Becoming bloodstained from her face to her chest at the time she hugged Alyssa, she is overwhelmed by anxiety as well as rage and dons a harsh gaze at the level of being able to kill people with it. While separating from the soldiers in order to organise things, Miyukare bowed her head facing the soldier who was placed on a stretcher with a cloth covering him. Even the soldiers, who were in the vicinity of the stretcher, mourn over his death while standing at attention. 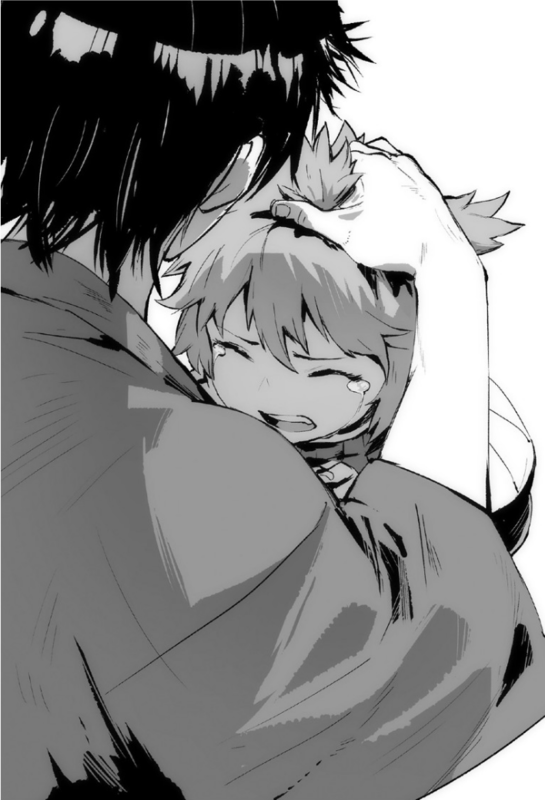 At the time Miyukare voiced out words of thankfulness once again, she could hear sobs leaking from someone with her ears. Alyssa, who returned to the feudal lord’s mansion, receives treatment in the medical room and is put to sleep within her own room in the building. And currently, in front of Hifumi, who is in his office, several soldiers with the rank of platoon leader and Miyukare are standing in a line. They are bowing their backs with an angle of 90°. It was Miyukare who answered Hifumi’s question. “Please”, the soldiers matched up their voices following up on Miyukare’s words. Miyukare and the soldiers, who raised their heads, noticed Hifumi smiling. A soldier points at Hifumi’s left hand which was covered by a glove. One of the soldiers answers as Miyukare hasn’t seen the battle. Hifumi is staring at the soldier, who talks with a serious look, while smiling. The soldier explains as many details as he can to Hifumi who is asking in a somewhat excited manner. Hifumi listened to that with a strange degree of good mood. Hifumi flatly declines the petition of the soldier who was filled with intense fighting spirit. The soldier, who hadn’t the confidence to bring it down definitely if speaking honestly, withdrew obediently. The fist, he tightly grasped in frustration, is filled with a strength to cause blood oozing out. Miyukare, who doesn’t believe in that, made a bitter face, but she remained silent as knows Hifumi’s aim. However, should he really talk about this here? She had those feelings. After bowing all together, the soldiers left. Only Miyukare remained in the room. Standing up, Hifumi affixed the katana to his waist. While laughing loudly, Hifumi tells her that he is going to see Alyssa and also leaves. Being left all alone, Miyukare tilted her head to the side. Miyukare felt a sense of discomfort, but she didn’t have the spare time to calmly think about it in this place. On top of a large number of people returning soon, there was also the first battle casualty. She can’t see anything but a future of being worked to death as civil official in charge of military affairs. She was worried about Alyssa, but deciding to leave it to Hifumi albeit feeling frustrated, Miyukare headed towards the other civil officials at a quick pace. Alyssa, who was lying on the bed at the time when Hifumi entered her room, turned her look towards him with her face being wrapped up in bandages. Given that she can’t move her fixated shoulder, she can only move her eyes somewhat. While saying “Don’t worry about it” due to the feeble laughter of Alyssa, Hifumi brought a fitting chair close and sat down next to her bed. Hifumi addressed Alyssa, who pulled up the blanket up to her face with her healthy left hand, in his usual manner. Hearing Alyssa explanation, Hifumi pondered about it. Having suddenly torn off the blanket, Alyssa’s figure being wrapped up in bandages became exposed. The slender, flexible, trained, small body had currently medicine and alcohol as disinfectant substitute applied to it and she was only wearing thin trousers on the lower party of her body. Taking out a magic potion from his darkness storage, Hifumi quickly checked Alyssa’s body while removing the lid. Taking off the bandages and fixations which covered Alyssa’s body from her right arm and shoulder up to her breasts, Hifumi casually applied the magic potion on her upper body half with its smooth and insufficient ups and downs. Alyssa stiffened her body for an instant to due to the coldness, but once her wounds heal and her pain decreases, she gradually loses strength. Hifumi, who confirmed her body to be healed after using around 70%, put his hand on the bandage on her face. He gently spills the remaining magic potion on Alyssa’s cheek. Floating tears with a *sniff*, Alyssa held both her hands due to the right hand which was placed on her head. Its heat is transmitted to her and an excessive grief fills her chest. Alyssa pushes her face into Hifumi’s belly as her tears begin to overflow and her expression crumples. Placing her arms, including the one which was healed just now, strongly around his back, she hugged him with all her might. Her mumbled crying voice continued to resound in the room until Alyssa fell asleep after getting worn out from crying. Thanks for the chapter, Shasu-san. Hifumi is deredere in this chapter huh. At less I know he not bad person at all, just the badass slaughter that all. I FORGOT how she looked like. She was a loli? I had no idea. Still more hints about his hand being covered with a glove. Seeing trends here. Did he fix it or is it cured and he’s milking it to catch an enemy off guard. There there cry all you want as there will be more blood ahead. The world will soon engulfed in a war unlike anything seen before as the clashes of each race collide with hope and despair. Thanks for the chapter, really Hifumi is a better bullshittier that I though selling the new DK as an enemy so easely. By the way when di this happen: “It was no one else but the knight Balzephon which Alyssa had provoked in the castle and lured to the dance hall where Hifumi was waiting.” thats bit how I remember that figth at all. During the rebellion in the castle of Orsongrande. Quite a while ago by now.